Using an overlock machine to finish a garment, even if it is homemade gives a neat and professional finish. This review will focus on brands that will provide you with a good range of functions and features for your ideal use. There are so many on the market that it can be quite confusing to figure out exactly how to choose the best one. Read on to find out what the 5 I have selected have to offer you. 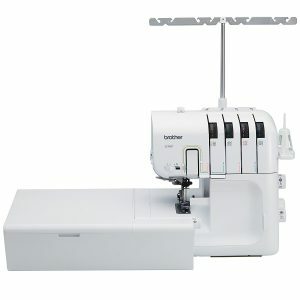 This machine is winner for a lot of people because of the ease of threading. Threading a serger is a daunting task which causes frustration for a lot of sewers, even with all the easy to follow colour coded guides. Pushing the thread through a tight space really makes it a challenge. So Juki has come up with s solution to solve this common headache. The novel Jet-Air Threading mechanism does all the tedious work for you. When you push the button after feeding just about 1 to 2 cm of thread toward the looper, the air does the rest, and you can rest easy. You never have to worry about incorrect threading again, because the threading order does not matter critically. Also, many people report slight issues with the way their machine serges after switching back from a rolled hem. This machine eliminates that problem with the automatic rolled hem setting, so you don’t have to wonder if you have made any mistakes which presented the issues. You can disengage the knife to prevent cutting while sewing and the presence of differential feeds makes even sewing a breeze. 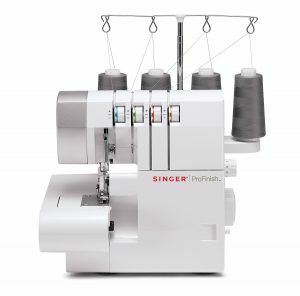 This machine houses four threads, but if you still haven’t seen what you’re looking for, then consider this next four thread option from Brother.. The noticeable difference with this machine right off the bat is the very large sewing table that it comes with. This immediately screams large projects, so if you’re a quilter this is one you want to look closely at. The sewing table is also detachable for when you need to get into those smaller areas like cuffs of sleeves or even for baby clothes. The stitches this overlock machine produces can be made with 2, 3 or 4 threads, so right away you know you’re getting versatility with the various types of finishes. This also means that you can choose the finish based on the type of fabric you are using. You also create ruffles with the included gathering foot and so much more, with other accessories. Another good feature is the colour coding for easy threading which I think, and I am sure you will agree is a plus for any serger. 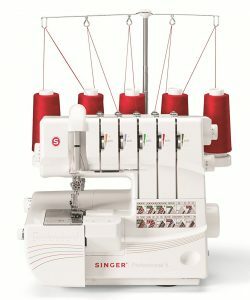 The Singer 14CG754 overlock machine does a pretty fast job at 1300 stitches per minute. The stitches it produces are formed from 2 to 4 threads and it comes with four pre-installed rolled hem stitch settings. The cloth plate can be removed for addressing smaller areas of garments or projects, to expose the free arm. The colour coding for easy threading as well as on the tension dials, helps you to be sure which of the threads you are adjusting. 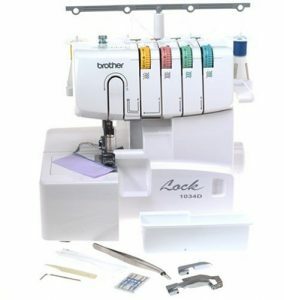 This 5 thread overlock machine allows you to create stitches with 2 up to 5 threads and is just as fast as the 14CG754 with 1300 stitches per minute. 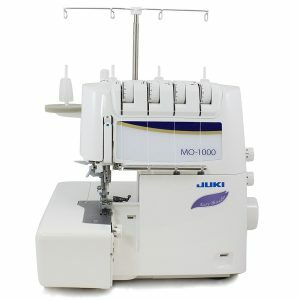 More threads mean a greater variety of stitches which is what you will get if you purchase this machine. One plus for me is the self adjusting nature of the tension system. Tension issues are very common among serger owners especially when switching between different types of fabrics and stitch styles or after re-threading. This machine is also quite easy to thread, complete with colour coding and a diagram. The stitch width and length are adjustable and you get 7 presser feet with your purchase! Just so you know what these are you will get the All-Purpose Foot, Elastic Foot, Blind Hem Foot, Shirring Foot, Beading Foot, Cording Foot and Taping Foot. Along with the regular accessories you can also look out for the clean pocket and anti-spill net, to catch trimmings. So this machine is definitely a step up from the four thread if you need many more options from your overlock. 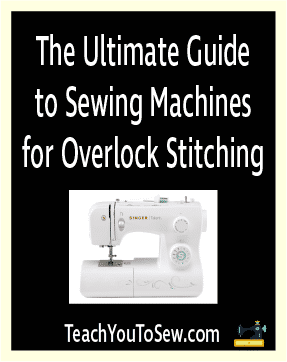 This overlock machine is fast becoming a household staple for beginner sewers as well as the advanced. Even though it is not self threading, I find that threading it is quite easy with the colour coding and also brightly coloured tension dials. There are 22 stitch functions built into this machine for creating three and four thread overlock stitches. These include rolled hems, narrow hems, ribbon stitches and flatlock stitching. As with many sergers you can slide off the sewing plate area to reveal the free arm for small projects. The differential fabric feed provides you with even feeding and stitching so that each project you do will have that professional finish. The manufacturers do not recommend using it if you live in a country whose electrical system does not facilitate the operation of appliances at 120V AC. Using a voltage adapter to achieve the correct voltage is not recommended either. If you choose to do this it would be at your own risk and you would void the warranty. The customer service line is available to provide you with any answers you may have about the use and operation of your new machine.